This week Rugby Tonight looked ahead to the weekend's eagerly anticipated encounter between New Zealand and England. Former New Zealand scrum half Justin Marshall discussed Dan Carter, the haka and how to beat the All Blacks. It might have been 1936 but this doesn't really compare to Chris Ashton's try against Australia. 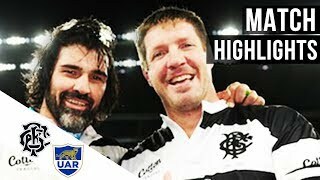 Argentina beat Barbarians 49-31 in a fantastic game of attacking rugby.